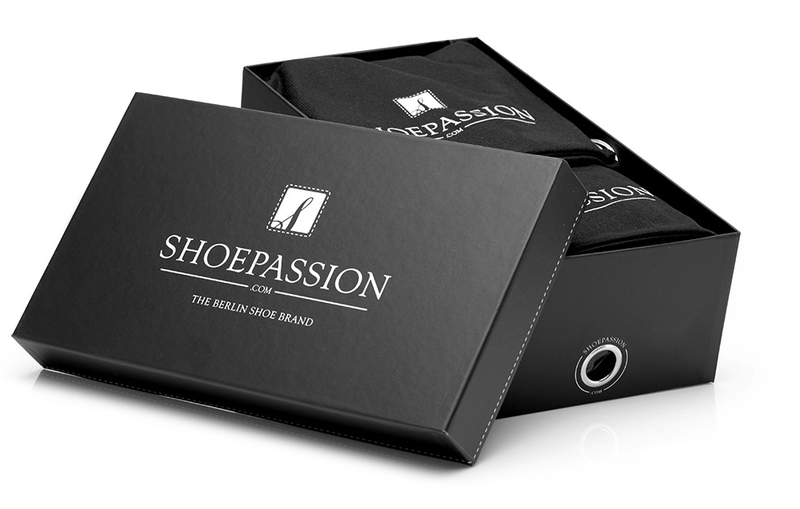 With the help of our foot measure PDF download, you will definitely find your right shoe size. Please follow the detailed instruction on the PDF. 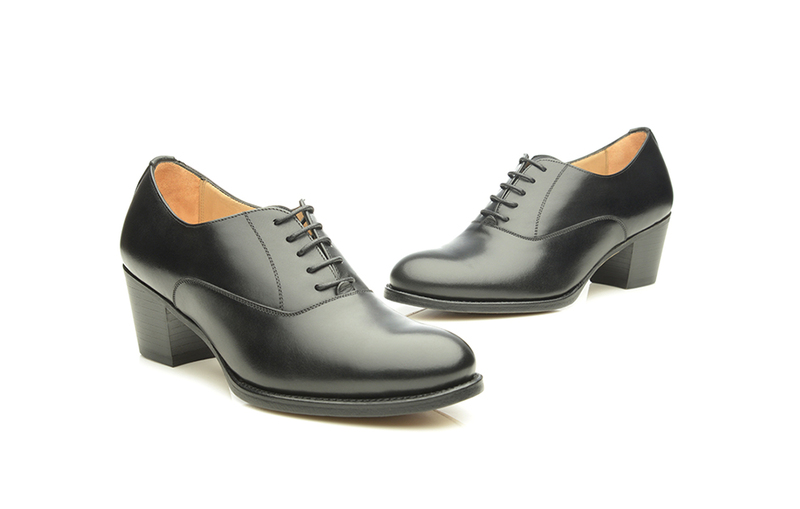 Initially reserved exclusively for men, our Goodyear-welted ladies' shoes are also nothing less than masterpieces of craftsmanship. Whether as a classic casual flat or in an elegant pump, opulently decorated or minimalist, each pair in our collection is crafted with attention to detail and precision, according to the long-standing rules of traditional shoemaking. In around 210 work steps, true connoisseurs of their trade transform around 65 individual parts made from exquisite materials into graceful and long-lasting companions. The quality across the women's shoe collection in general is unparalleled worldwide. 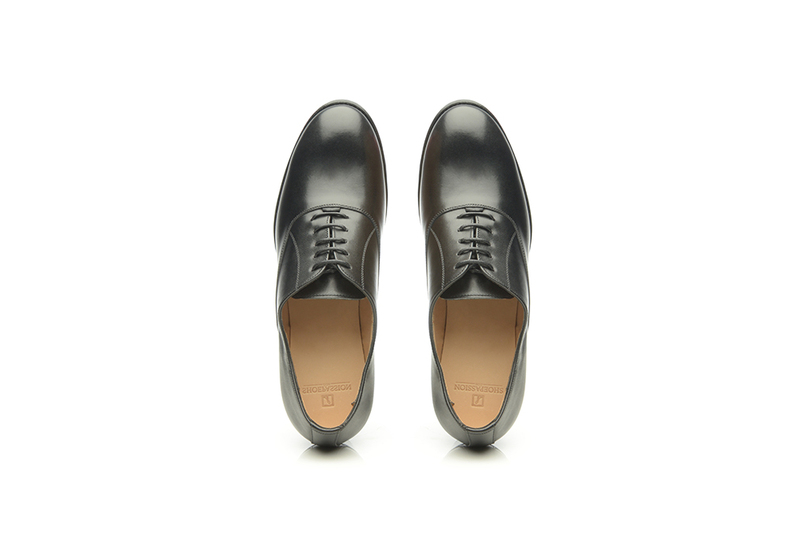 Sleek and minimal in design, the plain Oxford is widely considered the most elegant type of lace-up shoe. Nowadays, this legendary British shoe is no longer reserved for gentlemen—it has become a staple of women’s footwear as well. Thanks to Goodyear-welted construction and premium materials, this modern, heeled take on the erstwhile men’s shoe is the perfect match for classic, feminine apparel. 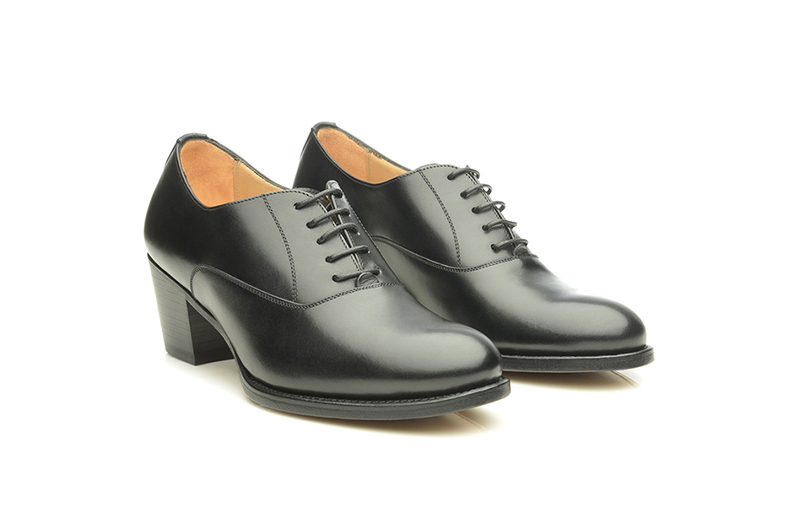 This women’s lace-up shoe is distinguished by a fully-dyed calfskin upper as well as a closed vamp cut. A closed vamp cut is created by stitching the vamp on top of the side shaft pieces. 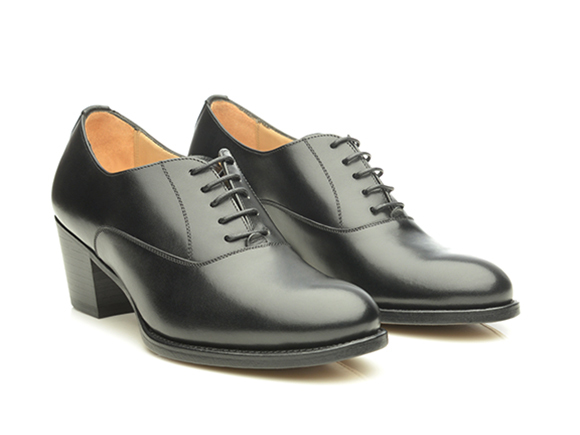 On a plain Oxford, the closed lacing is traditionally threaded through five eyelet pairs, forming a narrow “V” when the laces are done up. If the quarters open too wide when you wear this shoe, you have an elevated instep, in which case you are better off wearing Derby shoes. 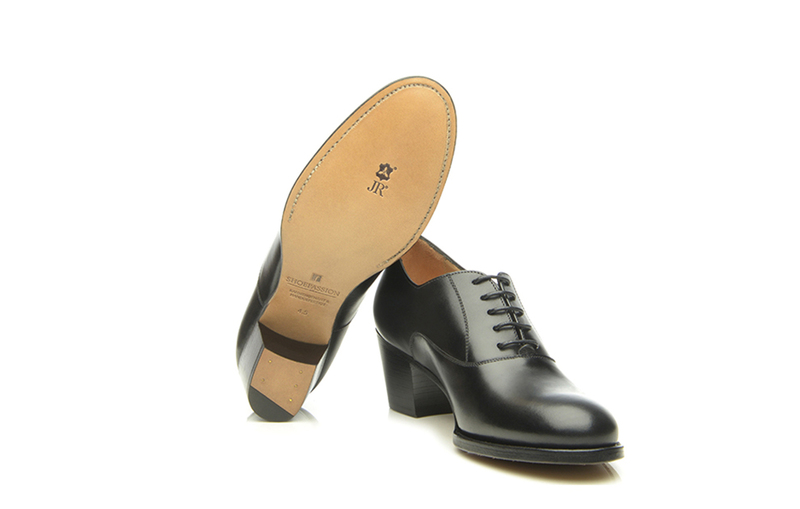 This premium Goodyear-welted, full-leather shoe is tastefully topped off with a Rendenbach leather sole and heel. This women’s plain Oxford in black is the perfect choice for elegant occasions, and pairs best with shades of black or grey. 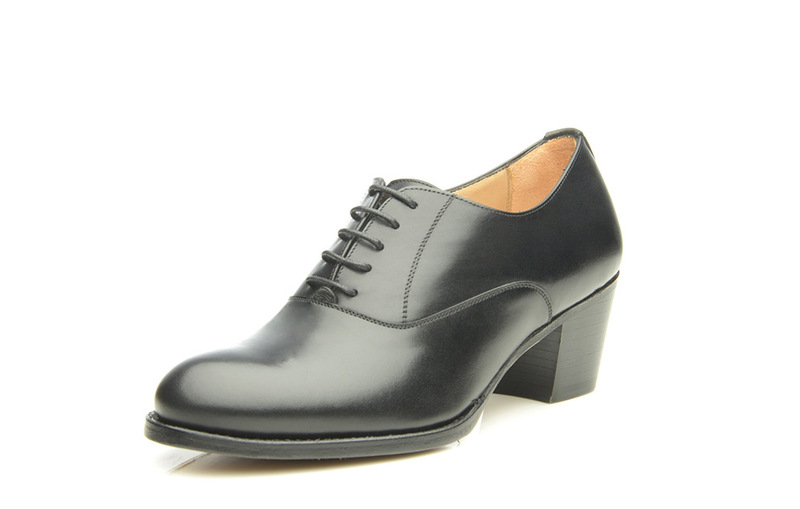 Its classic look—complete with mid-height heel— also pairs well with after-work attire. 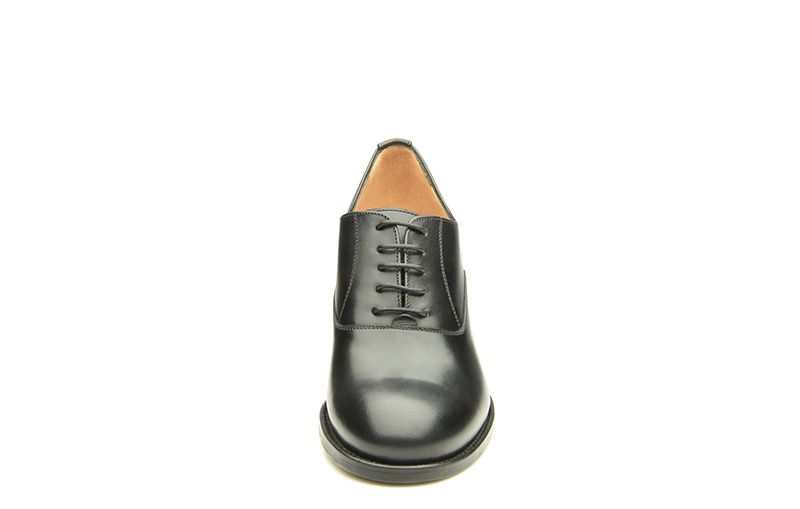 Smooth and undecorated, this black plain Oxford boasts closed five-eyelet lacing and a sleek, classic design. 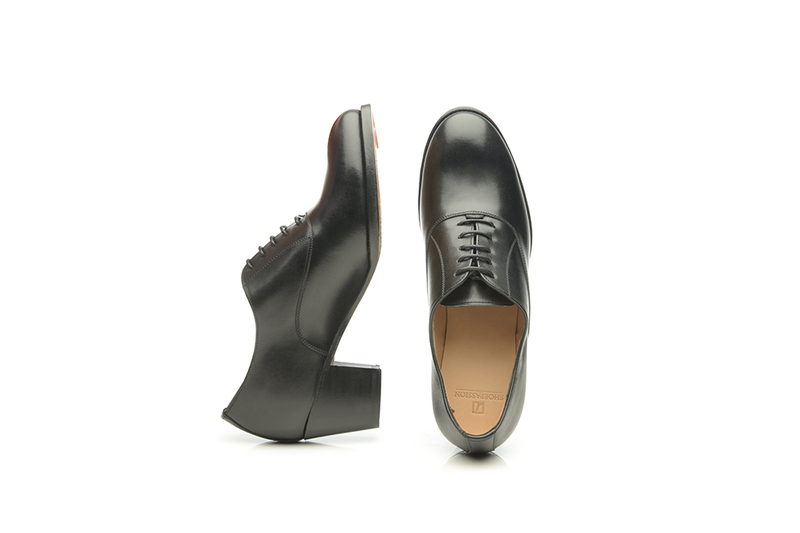 This is the perfect shoe for sophisticated occasions. It has also become an officewear staple. Subtly narrows at the front of the shoe. Features an elegantly rounded toe and a slightly elevated instep arch. The marked rise of the toe from the ground and the average-width middle portion of the shoe ensure wearing comfort. Ideal for average and high insteps. For the past 140 years, Rendenbach has used oak bark tanning to produce leather soles—the process can take up to nine months. These soles are renowned for their extreme durability and natural water repellency. Women’s shoes with Rendenbach soles are a real novelty.